Recently my kids and I were eating lunch when a neighbor boy knocked on the patio door. My six-year-old jumped up from the table to slide open the door. “Hi John, we’re eating lunch right now, and then I have a quiet time, but I can ask my mom if I can play after that.” I was thrilled that my son knew our daily “Quiet Time” was a non-negotiable part of a day at home. I have required my sons to rest after lunch since they were born…. For several years it was a nap, but when they began to give up naps, I still needed them to rest so their siblings could nap, and so I could have a moment of peace and quiet. I have taken the heart of this idea, and modified it slightly for our family. We have it right after lunch, because I want a quiet home in which to put my youngest down for a nap. Also, if the older ones fall asleep, I need them to do it early in the day rather than later! My kids are 3, 4 1/2, and 6 right now. Even though my boys share a bedroom, I have all three of them in different bedrooms for the rest time. I say, “It’s Quiet Time!” and the little feet run up the stairs. How did I get them to do this? I have made a deal that the first one up the stairs gets to pick the room they rest in. Being in my bed or the guest room is really exciting for them...hopefully that lasts a while! I make sure they’ve gone to the bathroom, make sure they have books, tuck them in, and set a timer for about 40 minutes. If they didn’t hear the timer go off, I open each bedroom to see who fell asleep, and tell the boys they can come back down to play. During the school year, we do school all morning, then have lunch, then quiet times. My boys know that after Quiet Time they can watch a show if we don’t have any additional school work to finish. This daily practice has been such a blessing to me. My boys are energetic and loud, and it brings me a little sanity to have them each in a room by themselves, focusing on books or their thoughts, so that I can organize mine! I usually start out the time finishing up a few housekeeping items (like responding to emails or making calls), and end it by having time with the Lord. What I like about this is that when my kids come down from their quiet times, they see me having mine too! I wish I was a morning person and could clock in a good quiet time before I have kiddos jump into my bed, but it’s just not me. Instead I try to play worship music in the mornings to start my day out inviting God in, but I need to wait to have focused time in the Word. Sometimes I need to get my focus back on God in the middle of the day, and having my quiet time then really helps me. During some of the tiring pregnancy months, I have even snuck in a quick nap. On weekends, my husband and I use the time to catch up on our to-dos, debrief on the church service, or just talk (sometimes it’s nice to do that when you aren’t tired from a whole day with the kids. :) ) Regardless of how you use the time your children are resting, we mamas need some free moments! I also love the training this is providing for my little guys. In a world so inundated with constant communication, I am thankful they are learning to be still. In addition, I think this has helped instill a love of books in them. Do you have a similar practice or routine in your home? If not, can you see it blessing your daily sanity? Posted on August 16, 2017 by Stephanie Hickox and tagged betsy's tips topics from Entrusted. I have truly enjoyed the beautiful weather this fall… although I will admit that the holidays catch me off-guard after such warm, sunny days! As I flipped the calendar to November, I decided I wanted to do something intentional each day of the month to thank God. 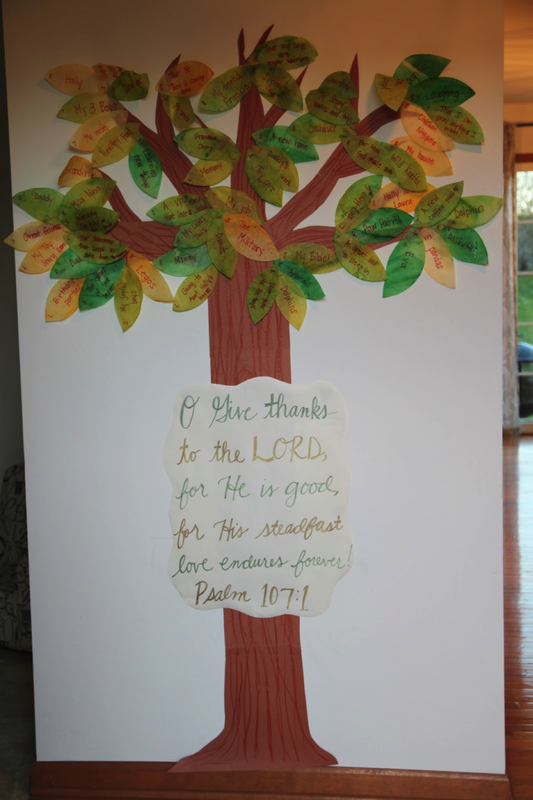 I also wanted to create a visual reminder in a prominent place in our home that would enable us to keep on praising and thanking our incomparably generous God. I quickly cut out a tree trunk and branches with my oldest son. Next, my middle son and I took 150 coffee filters and dipped them in dyed water. We laid them on cookie sheets to dry. Finally, I cut out leaf shapes from the dried coffee filters. Each night (or morning) we share something we are thankful for with each other. I write the item on a leaf, and tape it to our tree. Imagine my surprise when I walked into one of my best friend’s homes, and she was doing the same thing with her family! She had laminated leaves last year, and they kept their color wonderfully! Using these leaves, and traced handprints, Holly created a similar thankfulness tree. I love encouraging the practice of thankfulness. Giving thanks on Thanksgiving Day is wonderful, but doing it for a whole month--or a whole year--tills the soil of of our hearts to trust God. There are many ways to teach and model thankfulness, and this time of year is carved out to do so. Let’s take advantage of it! We are even asking our kids to say three positive things about a situation whenever they complain! I think this one needs to stay well after November! A few years ago I wrote a post about creating a family photo book recounting God’s faithfulness to your family. My children love our book, and they look at it frequently, so I wanted to share the post again. One of my favorite ideas from the Entrusted class was to make a yearly Top 10 List at Christmas. 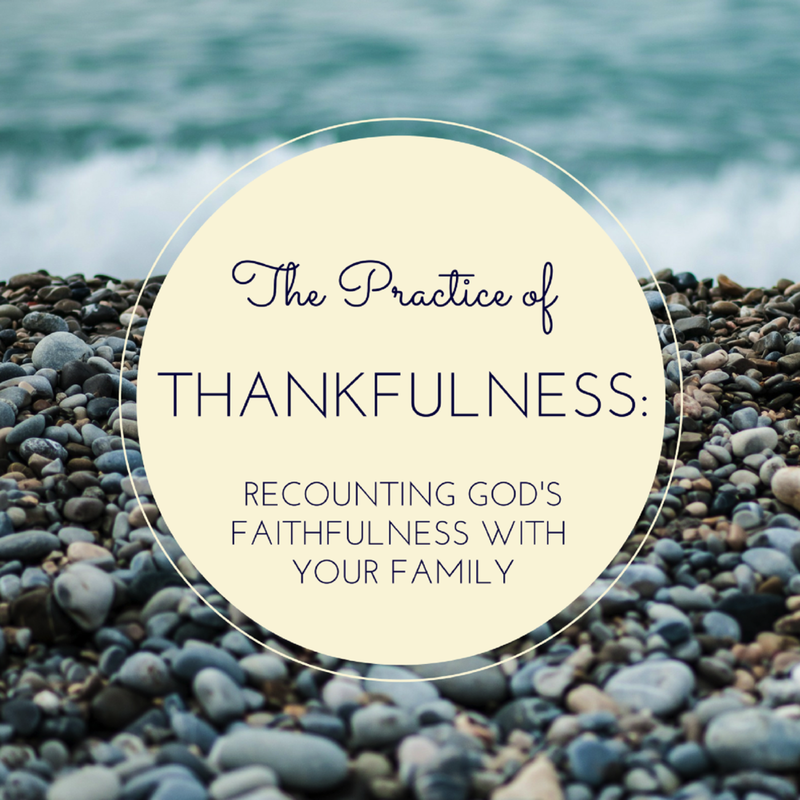 Betsy and her family always pause from the opening of gifts and the enjoying of food to recount God's faithfulness to them. If this sounds like a tradition you’d like to recreate, consider collecting your "Family Top 10” at Thanksgiving, and presenting the book at Christmas. You could also collect the list at Christmas and create it the next year. May recounting God’s blessings be ingrained in us all! Posted on November 16, 2016 by Stephanie Hickox and filed under Building Your Faith and tagged holidays topics from Entrusted. This month’s just-for-fun freebie is a reminder for those times when your kids want to get you on the merry-go-round. You know that frustrating cycle of arguing, sassing, back-talking, whining, compromising, or whatever other trick up your kid’s sleeve that somehow gets you to backtrack on what you just said? Betsy calls that getting on the merry-go-round in her Entrusted with a Child’s Heart class, and cautions you NOT to go for a ride. Heidi really hit it on the head when she said in her recent interview that she has to remind her daughter, “We don't argue. I am not a kid; I am your mom.” Of course we are not harsh dictators or unjust authoritarians. The aim of our charge is love, and the goal of discipline is to produce the peaceful fruit of righteousness. Sometimes healthy discussion is welcome and necessary. But sometimes, you just have to look your kid in the eye and say, “Hashtag, I’m the Mom!” I’ve found myself saying it so many times lately, I’m tempted to put it on a t-shirt! Until then, I’m hanging up this little printable in my kitchen. Among all the notes and pictures and homework sheets screaming at me from the fridge, this one is to remind me that I am in charge, and it’s for my kids’ good. We are responsible for raising good citizens, not people who think we’re awesome. It’s our job to make the hard calls (and by the way, who warned us that this was motherhood?! It was supposed to be all fun and snuggles all the time...isn’t that how the diaper commercials framed it?!) It’s not easy, but it’s necessary. Someone has to be the mom, and God has said you are it! I know how creative ya’ll are...why stop at a 5 x 7 on the fridge? This download has the mantra in lots of candy colors, and I can imagine it as a greeting card of encouragement, a gift tag or a bookmark. What will you do with it? Download the Free “#imthemom” Printable Here! Posted on October 26, 2016 by Laura Irion and filed under Building Your Family and tagged free printables topics from Entrusted. I love the Scripture Memory Cards that were included with my Entrusted Notebook! They were helpful and adorable! As I was purging for my recent move, I came across them. I knew I wanted to keep them, but I wasn’t sure how to utilize them after the initial memorization practice. A few fun ideas came to mind that I’d like to share so you can play them with your kids! Let your kiddos quiz you in the car! As moms we are often trying to make the best use of our time. I know many a mom that uses the drive to Awana or school to quiz her child on math facts or Bible verses. What about reversing the roles a bit? Give the packet of verses to one of your children. Have them give you a reference, or just the first three words. See if you can finish the verse correctly. My son had a BLAST testing me, and it reinforced the verses for him. It also provides some extra reading practice. For older children, guide them in putting the verses in the order they appear in the Bible. Use the Table of Contents in your Bible to help them. Select the verses that you and your kids really need to meditate upon, and tape them to bathroom mirrors to be read while they are brushing their teeth. The kitchen sink is a great place for verses for moms. Make sure you change it frequently so it doesn’t slip from your mind. You can also create your own memory cards with your kids! Write verses you are focusing on at home (or that they’ve learned at Awana or school) on index cards. Cut them in half if you can fit the verses on that space, and paste each card to a small rectangle of scrapbook paper. Laminate them if you can. This way your cards will have a fun pattern, just like the Entrusted cards. Buy a cute container to keep all of your cards in, so you can go back and play with old sets. Play the above games with your new cards to get God’s Word in their little hearts! They are sponges--let’s use that for God’s glory! Posted on September 14, 2016 by Stephanie Hickox and filed under Building Your Faith and tagged betsy's tips topics from Entrusted. I took the Entrusted with a Child’s Heart class when my firstborn (and only at the time) was 18 months old. How I stumbled into the class I’ll never remember, but this I know for sure: God had been saving my seat. Before I became a parent, I thought babies were like accessories. Sweet, cuddly little accessories. Once I had a baby, of course, I quickly figured out they were a little more complicated! Remember the first time, just around when your baby starts crawling, when you tell them “no no” in a gentle coo as they’re heading for the edge of a stair cliff? They pause thoughtfully in their path. Then they look you in the eye, flash you a drooly grin, and start crawling again straight for the very thing you just told them not to! I took the Entrusted class at a pivotal time when my focus as a mom had to shift from snuggles and story books to the hard work of loving discipline and character building. There is so much I could say about how Betsy’s curriculum changed my thinking about my role as a mother and encouraged me in the job I had to do. But on the lighter side of the class, there was a ton of practical advice! One of my favorite days in the class were “Betsy’s Tips” - specific, attainable ideas for having an intentional and joyful home. Decorate the house; sometimes put something special on their bedroom door or a garland of lights in their room at Christmas. Have lots of family traditions: “white elephant bingo,” “egg cracking,” gingerbread houses, etc. If someone was kind enough to give a gift or do a service for us, the least we can do is take the small effort to write a note to them. Includes birthday party gifts (Family saying: “It’s not yours until you have properly thanked the person”); not allowed to use the gift until the note is written. If your child struggles with writing, you can still teach them to show they are thankful. Why not try a video thank you? Non-negotiable in our house (among our immediate family). My son went through a phase recently where he didn’t want his brother or sister to be allowed to hug him. Nope. Hug and kiss your kids every day so that it becomes second-nature to them. Don’t let up even during the Junior High years. Train them to hug and kiss you too, every day! Mark meaningful verses with names and dates of friends and relatives, for a promise claimed, a prayer, or especially someone’s testimony verse, which is the verse that made them first believe the gospel. Our version of this, at our house, is a prayer jar filled with popsicle sticks. Each stick in the jar has something specific written on it that we are trusting the Lord to answer. We keep it on the kitchen table so the kids can choose a stick to pray out loud at meal times. When the prayer is answered (even if the answer is no!) we write the date on the back and it moves to the Answered Prayer Jar in my office. And then we celebrate the Lord’s faithfulness by eating a popsicle! Make it a goal to have each child go on a mission trip before they graduate from high school. It will forever change their perspective on the world and help them develop a love for people. Thanks, Betsy, for these and so many more! Posted on August 17, 2016 by Laura Irion and filed under Building Your Family and tagged betsy's tips topics from Entrusted. I want to steward their hearts, making sure they are being prepared to sacrifice their desires for the glory of their Savior. I recently wrote a post about the importance of Character Training as explained by Betsy in the Entrusted study. Self-control is just one area we are targeting, but it is an important one in my house! One reason I am writing this post now is because Christmas is right around the corner. Echoes of “I want that! I want that too! And that!” can be heard from many a child as they thumb through a toy catalog or pass by a toy aisle. Blessing our children with great presents can be a wonderful picture of the wise men’s gifts for the newborn King, but we do need to be intentional about communicating that. We also need to make sure our children don’t get everything they want. 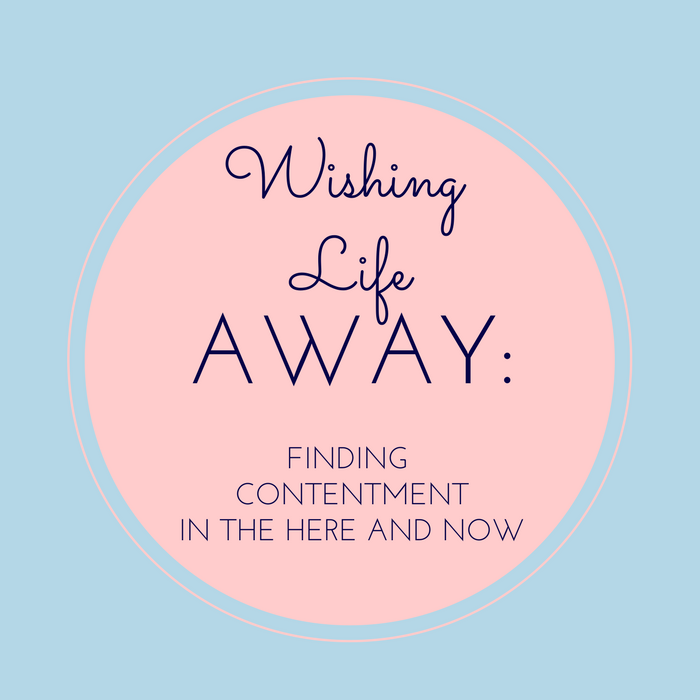 It is important for children to learn to delay gratification and deal with disappointment. No parent wants that to come on Christmas morning, but those lessons do need to come. I think we can prepare our children for self-control and sacrifice before Christmas morning arrives. Tell your kids “No” sometimes! Don’t give them a snack every time they ask. If dinner is in a half hour, they should learn to wait. (Of course there are exceptions to the rule.) Don’t buy them a toy every time you go to the store. Don’t say yes to every request. You get the idea. You’re not being mean, you are preparing them for the real world. When you make a grocery list, have your child make one too. Ask them to write down one special treat they’d like. When they get to the store, they need to stick to that item. 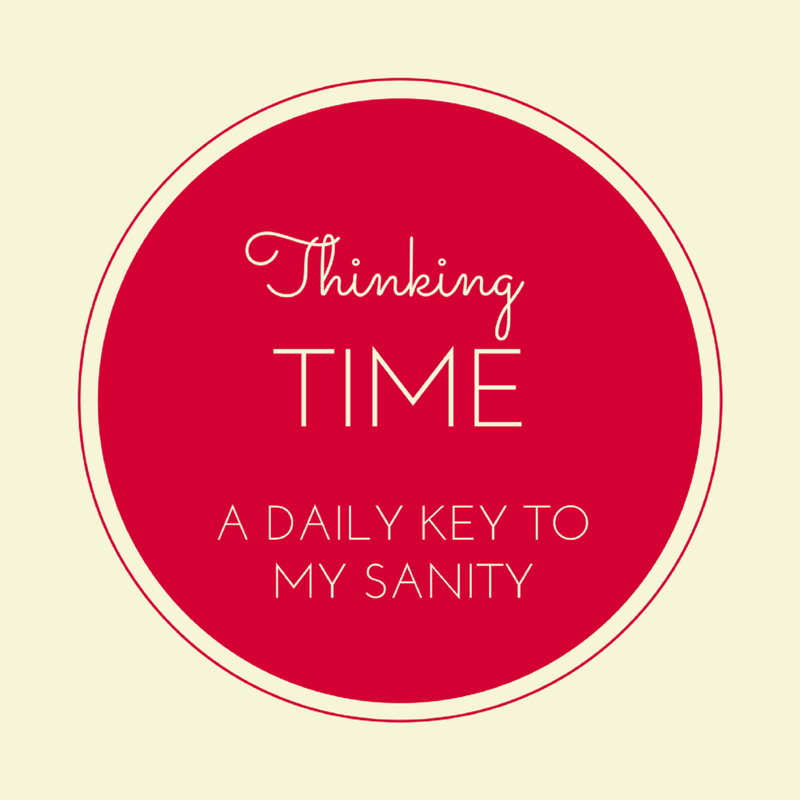 You don’t have to do this each time, but it is a good exercise for avoiding impulsivity. Make self-control towers! This one is Lincoln and Ryder’s favorite! I take large, cardboard building blocks and build a tower around their heads. They lay there, wide-eyed and grinning ear to ear. If they move in the slightest bit, their tower will collapse, and they will know they weren’t self-controlled. We giggle a lot with this one, and it is a great opportunity for them to learn to still their busy bodies! 3. Have your child make eye contact or sit still for a given amount of time. Be careful with this one! Too long could be cruel! Your child’s age, personality, and experiences will dictate the time for this one. Start with ten seconds and see if they can hold your gaze without looking away. It is an important life skill! If they are successful, try longer. Next have them sit still (explain the guidelines for that before you begin) for ten seconds. It is amazing how challenging these quick exercises can be. They are good practice for adults too—especially in this fast-paced society! 4. Try a “Kid Fast.” I’m calling it a kid fast because I am not telling you to ask your child to refrain from food. Instead, have them give up screen time for a day, or perhaps only eat things God made for a day. Do this along with them! Talk about the moments that are hard, and pray to ask God for strength with them. 5. Give your child more exercise. Last year, my mother-in-law bought a mini bouncy house for Ryder for his birthday. I bought soft helmets for the boys, and they have a wonderful time jumping around! In this climate, it was a fantastic investment! During the spring and summer, I found great success with taking a mid-morning walk with the boys. We’d do some learning time, take a walk, come back for lunch, and they have quiet times. They were much more prepared to rest because their little legs had worked hard! 6. Give clear directions. Ask yourself if your child really knows appropriate behavior for the given situation. Do they need instruction or discipline? Remember, 1 Thessalonians 5:14 says, Admonish the idle, encourage the fainthearted, help the weak, be patient with them all. (For further teaching on application of this verse, see Entrusted with a Child's Heart Chapter 9: Committed to Discipline (pages 280-285) “Sit still” can mean many things. Clearly define your definition so your child can be successful. Make sure it is age appropriate. Take time to model the situation. 7. Consider having your child do age-appropriate exercises for behaviors that are not discipline issues. Travis and I noticed Lincoln was interrupting us quite a bit. We retrained him on our “policy” for that. When he continued to interrupt, we instituted an exercise "consequence." Each time he interrupts, he has to do a few push-ups (and then he has to wait to tell us his point). It was very effective and helped him get more exercise! 8. Teach them a verse to memorize. Explain that a fruit of the Spirit is self-control and that God wants to give them success! Review it frequently, and try to fill them with hope! Don’t condemn them for their failures, but help them press on in hope. 9. Pray with them. Lincoln recently had to take a horrible-tasting medicine for four days. He got himself so worked up each time. It was one of those parenting moments that made you want to call in a sub! I realized I needed to pray with him before we started the process. The first time I prayed, I did it after he was already upset. Through tears he yelled, “It still tastes terrible!” We talked about being patient, and doing our part. The next time, I prayed beforehand, and it was much better. Lincoln knew that God answers prayer and God did give him the courage he needed! Blessings as you train those precious children! Posted on November 25, 2015 by Stephanie Hickox and filed under Building Your Family and tagged topics from Entrusted.